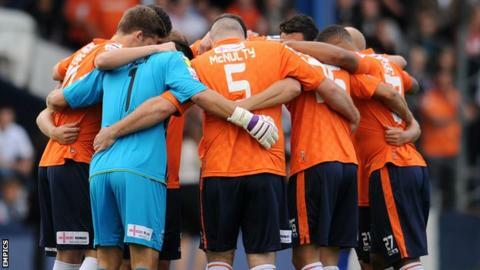 Luton Town have ended a five-year exile from the Football League by winning promotion from the Conference Premier. Second-placed Cambridge United's 2-0 defeat by Kidderminster on Tuesday handed the title to the Hatters. The U's are 10 points behind the leaders, an unassailable gap with just three games to play. Luton were a Championship club in 2007 but suffered three relegations in as many years and have been in non-league since the 2009-10 season. A series of financial setbacks saw them deducted 10 points in 2007-08 and then a total of 30 points the following season for remaining in administration and making illegal payments to agents. Consortium Luton 2020, fronted by TV presenter Nick Owen, acquired the Kenilworth Road side in 2008 and has since stabilised the off-field issues. But the Hatters had failed in each attempt to return to League Two, going through five managers and reaching two play-off finals in their bid to return. Boss John Still has achieved the aim in his first full season in charge and has now taken three clubs out of non-league, having accomplished it in 1989 with Maidstone and in 2007 with Dagenham & Redbridge. Chairman Owen told BBC Radio 5 live: "It is wonderful to be back in the Football League. "It's taken us five seasons. We've got close and lost some play-off finals and it is such a relief to get back there. "We have got a good side and played some lovely football this season. We have some youngsters who will only get better. "I nearly went to Kidderminster but decided there was something not quite right about going to a game hoping a team would lose. It's a great moment for tens of thousands of fans in Luton and around the world."